It’s time for cauliflower crust to move over. Barbecue Chicken Pizza with Sweet Potato Crust is a great alternative that holds up really well under all the delicious toppings! 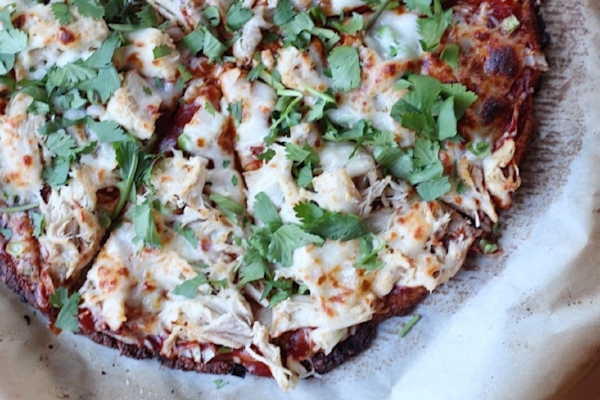 Make this crust and create your own masterpiece—Margherita, Thai Peanut Chicken, Meat Lovers—the options are endless. By using left over rotisserie chicken and your favorite jarred sauce, your barbecue chicken pizza recipe will come together quickly! To prepare the Sweet Potato Crust, preheat the oven to 400 degrees. Line a baking sheet with parchment paper and brush with 2 teaspoons of the olive oil. Add the sweet potato cubes to a food processor and pulse until coarsely ground—similar to the texture of coarse salt. Add the sweet potato, almond flour, parmesan, salt, garlic powder, and egg to a bowl and stir until combined. Transfer the sweet potato mixture to the prepared baking sheet and form into a 12-inch circle. Brush with the remaining tablespoon of olive oil. Bake until browned around the edges, 25 to 30 minutes. Top the sweet potato crust with barbecue sauce, mozzarella cheese, chicken and red onion. Place back in the oven and cook until the toppings are warmed through and cheese is melted, another 8 to 10 minutes. Sprinkle with fresh cilantro and serve!